CELEBRATING THE HOME VINTNER WINE GUILD COMPETITION WINNERS! The results are in - please celebrate with us the four guild members that entered AND won medals at this prestigious international competition. This year there were 2825 total entries judged covering 10 Countries and including 49 American States and 6 Canadian Provinces. The Home Vintner is proud of its customer’s achievements in attaining 590 awards and medals in various home brewing competitions. Our Home Vintner Wine Guild won 1/2 of the awards in the Province - 35 out of 68 with Wayne taking Alberta Winemaker of the Year & Pat taking Best of Show. The top 30 bottles of wine from the AAW were submitted to the 2012 AWC Competition. 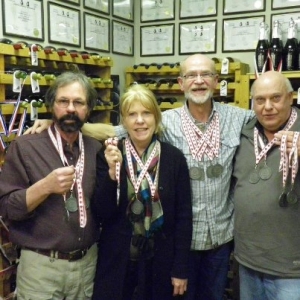 Our Home Vintner Wine Guild won 15 of 26 medals awarded. WAYNE TOOK “WINEMAKER OF THE YEAR 2012”! PAT TOOK “BEST OF SHOW 2012”! This year, we garnered 38 more awards , & not only took Best of Show - White / we also took Winemaker of the Year 2011 in the Alberta Amateur Winemakers Provincial Competition! On to the Nationals, late August, in Nova Scotia! RON TOOK WINEMAKER OF THE YEAR 2011!